Have a question for DCTA’s customer service team? 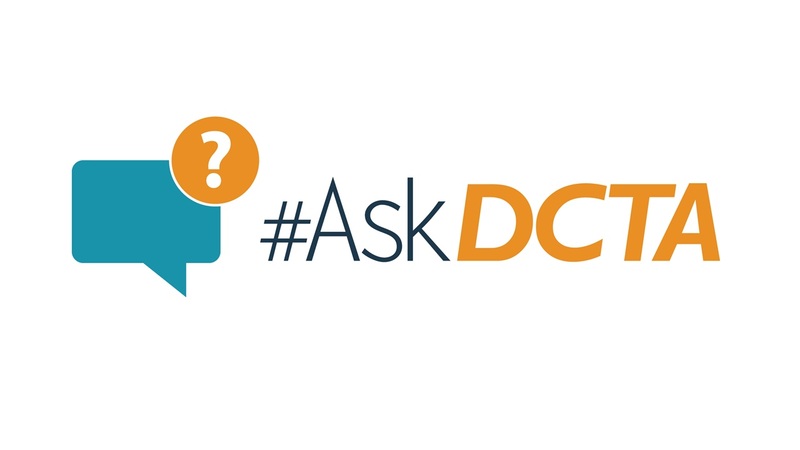 Now you can #AskDCTA! In our monthly blog series, our customer service team answers frequently-asked rider questions to better engage with our riders and improve their experience when riding DCTA. For the month of January, Samantha Balderas – our customer communications specialist – provided insight on our new fare structure which went into effect on January 14, 2019. Why did DCTA’s fare structure change? On Monday, January 14, 2019, DCTA’s fare structure underwent a significant overhaul. The changes included the permanent price reduction of Local Fares to match the August 2018 promotional prices and the elimination of the Connect Fare. These changes are intended to create a simplified fare structure that provides you with expanded travel options. The primary goals of our fare changes are to streamline our fare structure for easier understandability, provide regional fare consistency with DART and Trinity Metro by aligning us with our regional transit partners and offer lower local fare options to encourage ridership on our system. What Are the Key Changes to the Local Fare Structure? Fare prices featured in DCTA’s Local Fare Promotion are now permanent. The Local Fares were reduced to a price point that allows you to purchase one DCTA Local pass and one DART/Trinity Metro Local pass for less than the current Regional Fares. The easiest way for a passenger to take advantage of this deal is by using the GoPassSM mobile app which can be downloaded from the Apple and Google Play store. Riders can also purchase paper passes online, at the ticket vending machines (TVMs) or at the various ticket sales locations. All Local passes can be used on the DCTA Connect Bus, Denton Enterprise Airport On-Demand service, Lewisville Lakeway On-Demand service, A-train, Highland Village Connect Shuttle, North Texas Xpress (from Denton to Alliance), North Central Texas College (NCTC) Campus Shuttles, and the University of North Texas (UNT) Campus Shuttles. We’ve added Local AM and PM passes which allows passengers to have access to more DCTA services at a cheaper price. The Local AM pass is valid from the start of service until noon. The Local PM pass is valid from noon until the end of service. The cost of each pass is $1.50, or $0.75 for those who qualify for reduced fare. Prior to the local fare promotion, riders paid $1.50 for a single ride on our Connect Bus service. Now, that same $1.50 will get you a Local AM/PM pass that gives you multiple hour’s access to most of DCTA’s bus services as well as the A-train! Will my Connect Pass still be accepted on the bus? Customers with active Connect passes will need to exchange their old Connect Fare media for new DCTA Local passes. Riders can trade a single ride Connect ticket for a Local AM/PM pass. Monthly or annual Connect passes will be exchanged for their Local fare counterparts. You can exchange Connect passes at the Downtown Denton Transit Center (DDTC) or onboard DCTA buses with your driver. Please note, the deadline to trade Connect Fare for Local passes is February 28, 2019. Connect Fare will no longer be accepted after the deadline. Can University Students Continue to Ride the A-train for Free? The University A-train Free Ride promotion which allowed UNT, NCTC, and TWU students to ride our A-train and North Texas Xpress (between Denton and Alliance) for free ended on Monday, January 14. Moving forward, university students, faculty and staff will need to have appropriate fare to ride the A-train and North Texas Xpress. The University Pass Program is still available for purchase. Students, faculty, and staff from UNT and NCTC can continue to ride the Connect Bus service as well as DCTA’s on-demand services in Denton and Lewisville at no additional charge with a valid school ID. We hope Samantha helped answer all your questions about the new fare structure.